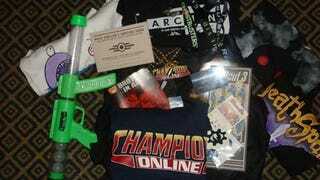 Schwag Off: Who had the Best Schwag of PAX? There was plenty of cool stuff to grab at this year's Penny Arcade Expo. Lots of t-shirts of course, stickers, wrist bands, all of those freebies from bungie, the boxes of stuff. You could even get a free copy of Brothers in Arms: Hell's Highway if you were willing to have your head shaved. Tristan got a free spray-painted tattoo. (There were two designs) Among all of the largess two companies' swag really stood out though.Bethesda had thousands of copies of The Official Vault Dweller's Survival Guide to give away. They also had friggin Vault Boy puppets. Puppets, that were Vault boy! Cryptic, on the other hand, had a whole bag of goodies that gamers could score from drawings at the show. The goodies included a full-sized Champions Online backpack, a gun that shot glow-in-the-dark ping pong balls, a t-shirt, a personalized super hero ID card and a Champions Online skateboard deck. Which do you think was better?